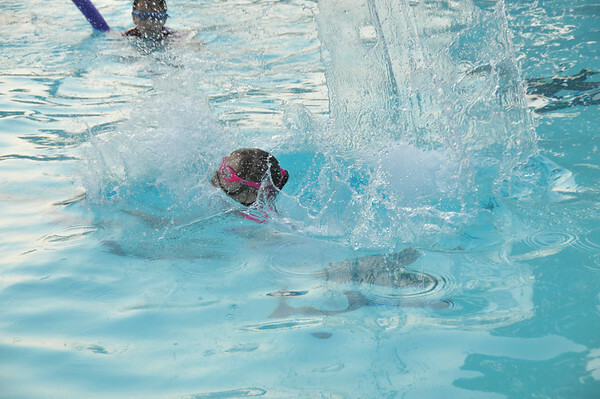 Katie, my youngest, used to hate the water. She doesn't like to put her head in and is afraid the water will get into her eyes and go up her nose. This is the exact opposite of how I grew up. I can't remember not being in the water as a kid. My mom used to take me and my brother to Grandma and Grandpa's on Long Island and we would go to the beach. I remember going in the Ocean and if I was tired of that they had a pool too. I insisted when I was four on going to a swim camp for the summer, Camp Badger - a day camp. Mom used to make me get out of the ocean because my lips had turned blue. Katie has always been the opposite. She likes to go to the beach but isn't a fan of getting wet. She would rather build sand castles then let water get any where near her head. She has started to change her mind but is still afraid to put her head in the water and thinks she is going to sink. The swim lessons have helped and she is willing to put her face in the water for a second these days as long as her goggles are on (and yes, she counts to one). One of the big things they have been working on in swim class is jumping off the side of the pool and Katie will do it as long as someone will catch her. That finally changed this past weekend. We were out at the pool with my brother and his family when Katie decided to jump in if I would catch her. I refused and said I would let her jump as long as all I had to do was keep her head above the water. The first jumped I grabbed her right before her head went in and the second too. Then I moved back and said she didn't need me but I would grab her if she got scared. Katie finally agreed and after counting to 3 numerous times 1...2.....I'm scared! 1....2....I'm really scared..but I want to do it! 1......2.......3....I'm scared! 1......2........3! She did it! She then jumped 12 or 13 more times all by herself and isn't scared anymore. Yeah Katie.